The route through Gressingham village is now closed for works to Town Bridge, which are due to last until 24 October 2014. 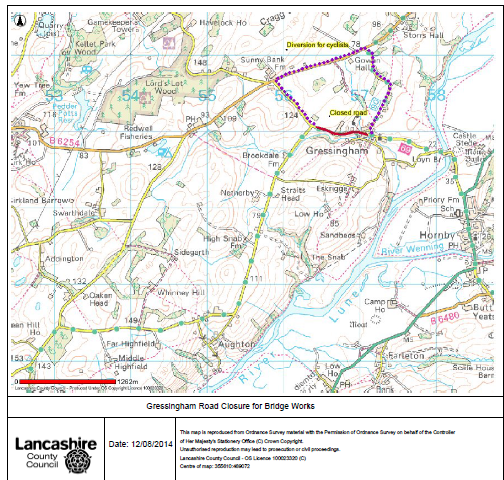 Following feedback from cyclists, Lancashire County Council has signed a new diversion route for cyclists to the north of the village. The diversion starts from mile marker 12.5 and then joins the B6254 for a short distance before following route 90 back to Gressingham. You can follow it using the offficial Way of the Roses Cycle Route Map, available from the Sustrans Shop and some information centres like the one in Morecambe, which is across the road from the promenade and the route's western terminus. ← Looking for the next challenge?